The first thing that crossed my mind when I heard there was an Earth-like planet 600 light years away was an optimistic hunch that it had Subways. 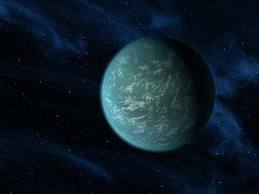 NASA planet-hunters say the sphere they’re dubbing Kepler-22b is likely to have all the critical elements necessary to sustain human life. To me that means Subway. It would be fun to gauge the instant reactions of our fellow Earthlings when they heard a life-sustaining planet was discovered. There’s a natural human euphoria when we find a place no one’s ever been, a place we can call our very own. Pilgrims felt it when they landed in what they called the New World, a place that had been inhabited by Native Americans for tens of thousands of years. What followed was more than 400 years of mutual hostility, betrayal and genocide culminating in saturation casino gaming and Facebook fights over whether sports mascots for teams with names like Redskins were tributary or mockery. This Kepler-22b -- and, geez, couldn’t we please get someone with a spark of creativity on the NASA planet-naming squad? -- is, as mentioned, 600 light years from Earth. Do you know what a light year is? Shame on you if you said it’s a unit of measurement that’s less filling than a regular year. A light year is 5.9 trillion miles. That means it would take about 22 million years for the space shuttle to get there (better hope they opted for the lifetime subscription to satellite radio). What worries me is how the NASA scientists all seemed to exhale when they heard there’s another planet we can inhabit, as if it relieves some of the pressure to treat this one with a little more care and dignity. He makes it sound like we’re going to land on Kepler-22b and be delightfully surprised to find drapes on all the windows. It’s like he’s putting a downpayment on a new home when this one’s in such sad shape no one would ever dream of buying it, an interstellar version of how we got into the subprime mortgage mess. We Earthlings are so stricken with wanderlust. We’re always in a crazy rush to get to the next someplace different. We can’t be satisfied inhabiting our own neighborhoods and making pleasing improvements to what’s already ours. I’m as guilty as the next guy. I dream of what it would be like to board the first transport to distant Kepler-22b, just past, I’m guessing, Kepler-22a and Kepler -- if you start seeing signs for Kepler-22d, you know you’ve gone too far. Imagine, leaving Earth and all you’ve ever known and loved behind for an unknown future 22 million years away. Heck, I’d go tomorrow if it meant I’d miss Madonna performing at the Super Bowl halftime show.